YA Books Central presents 12 heartwarming, bone-chilling, and magically enchanting stories from the award-winning, New York Times & USA Today Bestselling authors of the YABC Staff. YABooksCentral.com is one of the leading children’s and adolescent literature sites on the web today. With much love, our staff of volunteers brings our readers this collection of YA stories representing the genres we love at the most wonderful time of the year. A Christmas Eve party could ruin everything when a cruel joke crushes Peyton. And the only way to make her see just how beautiful she is might be to reveal the feelings Cam has tried so hard to hide. With airships descending from the heavens, can Kylah survive Christmas Eve? Sometimes you find love where you least expect it. Begin with a wish: For family. For love. For light. What happens when vampires invite werewolves over for Christmas? Join Cassie as she learns that home is where the heart is through experiences with holiday fun, new friends, and rewarding work. What do you get the perfect girl for Christmas? 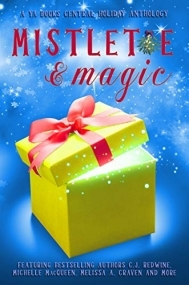 A mysterious stranger makes wishes come true and injects some magic into an otherwise dreary holiday.